Playing blackjack games on which you can place all manner of additional side bet wagers is going to open up a range of winning opportunities, the High Streak Blackjack game for example has such an optional side bet wager on offer and by placing it you have the chance of winning a payout when you get a series of winning hands dealt out to you. However, it is often the case the base game of any bonus payout awarding blackjack game variant will be one of the more commonly available games and in the case of High Streak Blackjack the base game is the European Blackjack game. With this in mind you will be interested no doubt to learn there are two decks of playing cards in the shoe of this game which are always shuffled before a new hand is dealt out to you which does of course mean you are not going to be able to count cards when playing this game online. 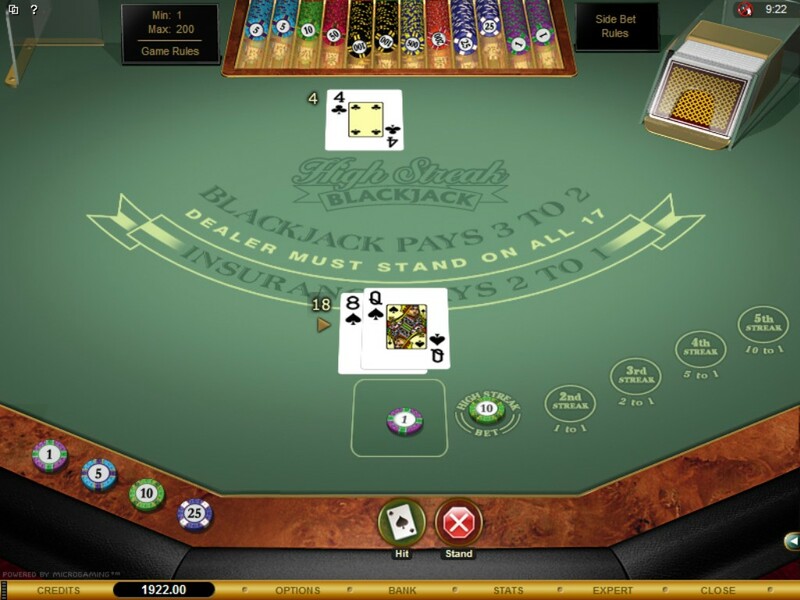 High Streak Blackjack is played as no peek game and as such the the dealer initially deals out to his hand just one face up card in the initial deal, as soon as you have made your betting decision on each hand you have placed a wager on the dealer will stand his hand when it is 17 or higher in value and will always high any hand worth 16 or lower in value. The bonus payouts will only be awarded to you if you have placed the side bet wager and when you get two winning hands on the trot the bonus payout is worth even money on your side bet wager. The side bet wager will then stay on place for the next hand dealt out and if the third hand is also a winning one the bonus payout is worth 2 to 1. Once again if you do get three consecutive hands winning on the trot the bonus bet stays locked into place and a fourth winning hand on the trot sees you being awarded a bonus payout of 5 to1 and if the next hand is also a winning one you will then be paid out a bonus payout worth 1.00 to 200.00 and by adopting the perfect playing strategy for this game the house edge will be as low as 0.42%. You will be offered the insurance side bet option but that side bet comes with a huge house edge attached to it so never be tempted to place it even though the 2 to 1 winning payout attached to that bet may seem attractive it is a very poor valued bet to place. You are never under any obligation to place the side bet wagers, however when playing the base hand if you have been dealt out a hard 9, 10 or 11 hand then you can double down that hand. You can also split any matching pair of cards such as two 8’s but any pair of unalike 10 valued cards cannot be split. If any aces have been split then you can hit that hand as many times as you like unless of course the value of those split aces becomes higher than 21 in which case you have bust those hands. There is only one way that you should play Perfect Pairs Blackjack and that is the correct way! You will find displayed on this website a blackjack strategy card for playing the base game of Perfect Pairs Blackjack and you should always refer to that card when playing this game online as by following the playing strategy listed on it you will always be playing off each hand in the most strategic way. Surrender – No surrender option is on offer on the Perfect Pairs Blackjack game, but if you do wish to play a game offering that playing option two games worth taking a closer look at the games of Atlantic City Blackjack variant and the Big Five Blackjack game. Doubling Down – To double down you need to place an additional bet equal to your initial wager onto the betting layout to be dealt just one extra card to that hand and the perfect playing strategy for this game will call for you to double down a hand when that hand is a pair of fives or a hard 10 or 11 valued hand when the dealer is showing a 2 to 9 valued card and also double down a hard 9 valued hand when the dealer has on show a 2 to 6 valued card. Hitting a Hand – You are going to be playing perfect strategy when you hit a 5 to 8 or hit any soft 13 to soft 17 valued hands. When to Stand – The best time to stand your hand is when you have been dealt out a soft 19 or a soft 20 valued hand, many players will split such a hand when the dealers up facing card is a low valued one, but only every stand those soft 19 or soft 20 hands as by doing so you will be playing perfect strategy. Insurance – You should not take the insurance bet option when offered to you, for the house edge attached to the 2 to 1 paying insurance wager is very large and will give you no playing value what so ever. Not all Blackjack bonuses awarded by online casinos can be used on the Perfect Pairs Blackjack game due to the game having such a low house edge, so make sure you check through the bonus rules before you start to play this game with bonus credits to make sure you can indeed play it. One thing out will be able to get awarded with when playing this blackjack game online for real money are comp and loyalty points. 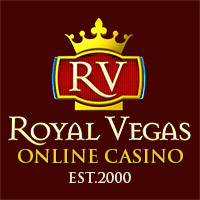 But each online casino will have their own unique player reward scheme in place and some of them are much more generous than other in regards to rewarding their players with comp points and some have much lower redemption rates than others.